Shrimp biryani is becoming very popular. Unlike other kinds of biryanis it is quicker to prepare. It is full of flavor, suited for lunch, dinner or for a dinner party. Shrimp biryani is very easy to make and tastes as good as chicken Biryani. Shrimp biryani is two step processed. Rice and shrimps are cooked separate. After cooking they are put together and later baked. 1. Remove the shell from the shrimp and pull the tail off. 2. Take a shrimp one at a time and with a knife make a shallow slit from neck to tail on the top back of the shrimp, and remove the black line, the vein that runs down the back. Make sure you get the entire vein out. Repeat until you clean all the shrimps. 3. Rinses shelled and deveined shrimps, drain all the water out and place them in a bowl, sprinkle 1 teaspoon salt and lemon juice, mix and keep them aside. If not using right away, place the bowl in the refrigerator. 4. In a frying pan heat 3 tablespoons oil on medium heat, add fine chopped onions and minced garlic and sauté them for 7 to 8 minutes or until they become light brown, stirring frequently. 5. Add coriander powder, red chili powder, turmeric powder, mix with fried onions and fry for few seconds. 6. Add chopped tomatoes and yogurt and cook for 7 to 8 minutes or until tomatoes become soft and all the water in the masala evaporates. 7. Add grated ginger, chopped green chilies and bay leaves, and mix with masala. Once you see the oil on the side of the pan it means masala is done. 8. In the masala add 1 cup of water, cover and cook on low heat for 5 to 7 minutes or until half of the water evaporated, stirring periodically. Shrimp does not take long to cook, so you need to first cook the onion masala. 9. Now add shrimp and ½ teaspoon salt, mix well so that all the shrimps are coated with the masala cook on a low flame for 5 minutes, while stirring constantly. Once shrimp are cooked add 2 tablespoons chopped coriander leaves and mix, turn the stove off and remove it from the burner and keep it aside. Do not overcook the shrimps as they will get rubbery in texture. Rice can be cooked two ways, either cook them with onions or just boil them in plain water. 1. Wash and soak the rice for half hour. 2. In a sauce pan heat 3 tablespoons oil and add length wise sliced 2 medium onions and sauté them on medium heat for 10 minutes or until the onions become dark brown and caramelized, take them out leaving the oil in the pan and keep them aside on paper towel for garnishing. 3. In the same sauce pan with the oil add remaining 1 sliced onion and fry for 7 to 8 minutes or until the onions become dark brown. 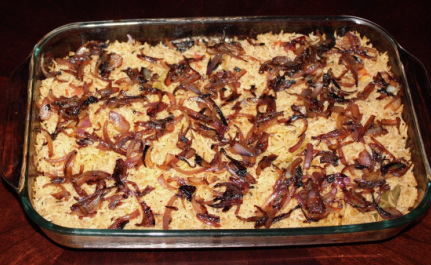 Dark browned onions give the nice color to rice. 4. If you wish add 2 bay leaves, big cardamoms and cinnamon stick and fry for a minute. 5. Wash and drain the rice, add to the browned onions and sauté for about 2 minutes, being careful not to break the rice grains. 6. Add 2 cups of water and salt, stirring gently mix with rice and fried onions, turn the heat to medium high, let the water boil, leave the sauce pan uncovered. 7. Water will start boiling in 5 minutes let the rice boil for 2 to 3 minutes, water will reduce slightly, turn the heat down to low, cover the pan and simmer for another 5 to 6 minutes or until rice 2/3 are done and all the water evaporate. Turn the stove off. 8. Do not fully cook the rice because they will cook in the oven too. Remove it from the stove so that they do not cook any more. 1. In ¼ cup of warm milk add some saffron strings and keep them aside for later use. 2. Grease a 7” by 11” or 8” by 8” square baking dish. 3. With a fork fluff the rice and gently with the cooking spoon scope them out from the sauce pan and evenly layer half of the cooked rice in the baking dish.If you wish remove the cinnamon stick and big cardamoms from the rice if they were added, you may not want to eat them. 4. Layer the cooked shrimp and it’s gravy over the rice. 5. Over the shrimp spread sliced onion rings, and chopped coriander leaves. 6. Now add another layer of cooked rice over the shrimp. 7. On the top of rice sprinkle saffron milk all over, and garnish with the previously caramelized onions and chopped coriander leaves. 8. Cover the dish tightly, if the dish does not have a cover or have a plastic cover then use aluminum foil and cover the dish nicely. 9. Pre heat the oven at 350 degree and place the dish in the oven for 10 to 15 minutes. 10. Turn the oven off, take the dish out and let it sit for 5 minute. When ready to eat take the cover off and serve. Please take the time to let me know what you think about my recipe. Your comments would be helpful to me to improve the recipe.